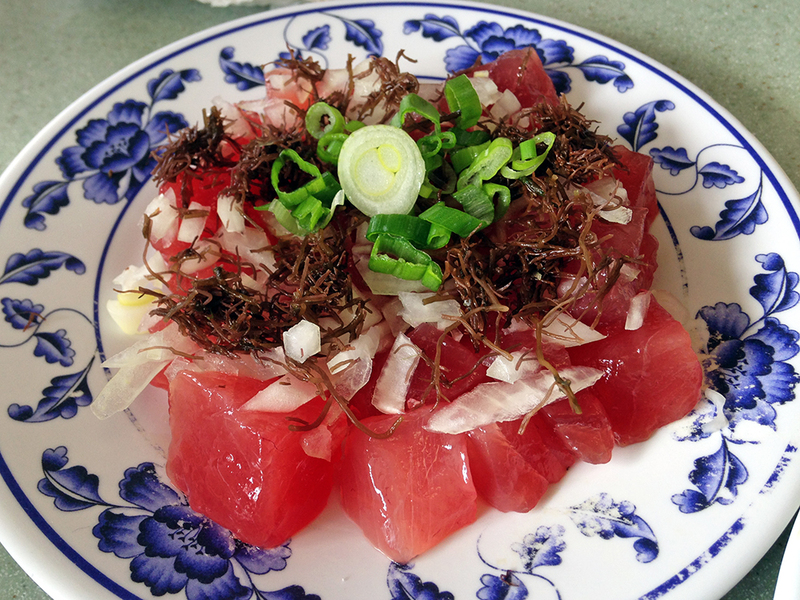 Every since going to Oahu, Hawaii, my wife and I have been obsessed with poke (“po-kay”). 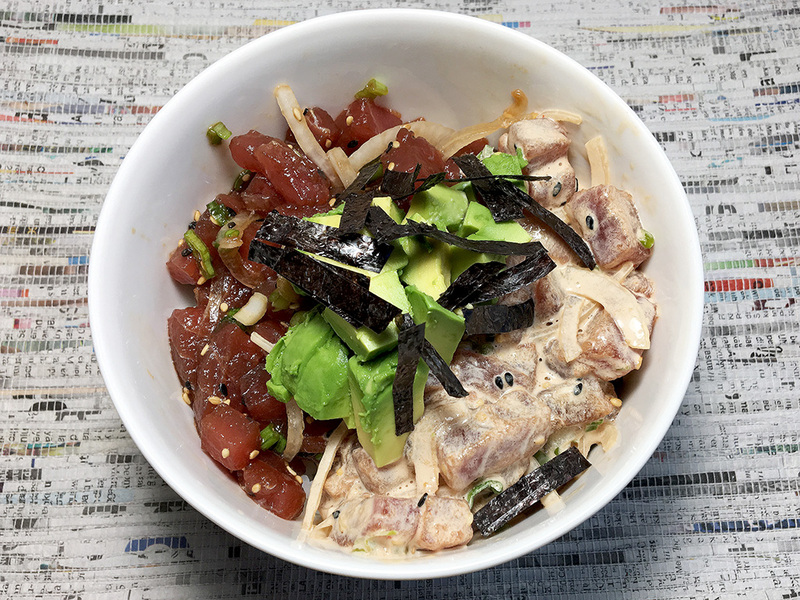 If you’ve ever had sushi (especially tuna sashimi or a tuna roll) and loved it, then you’ll love sushi’s stocky, less-well-traveled cousin, poke! I say less well traveled, because sushi is everywhere while poke is tragically so much harder to find. The dish is more like “fish salad” made most often using raw ahi tuna, but is also made using cooked octopus or other seafood. 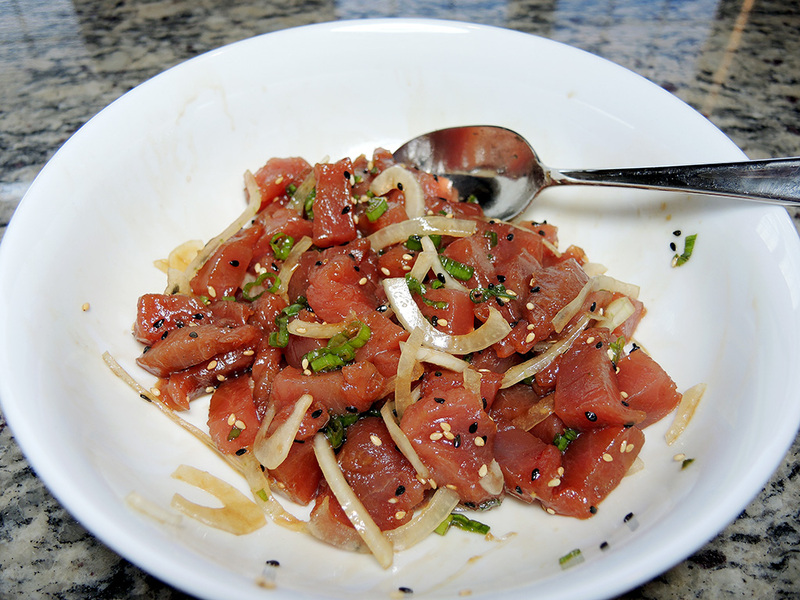 When we had poke we couldn’t believe the bounty of our bowls, which were brimming with beautiful, fresh, red ahi tuna. We had it served over rice and topped with fresh onion and scallions. I also had it with chunks of avocado mixed into it and even simply without rice, but topped with some fresh dill. The point is that it’s versatile and delicious so many different ways. Upon returning to the Northeastern, U.S., we found that while we were richer for having known poke, we were now poorer without it. The result is this recipe that aims to recreate some of the magic found in Hawaii. Try it with dill, spicy mayo, plain, or over rice. Feel free to experiment by adding or subtracting ingredients from this recipe because it’s all good! 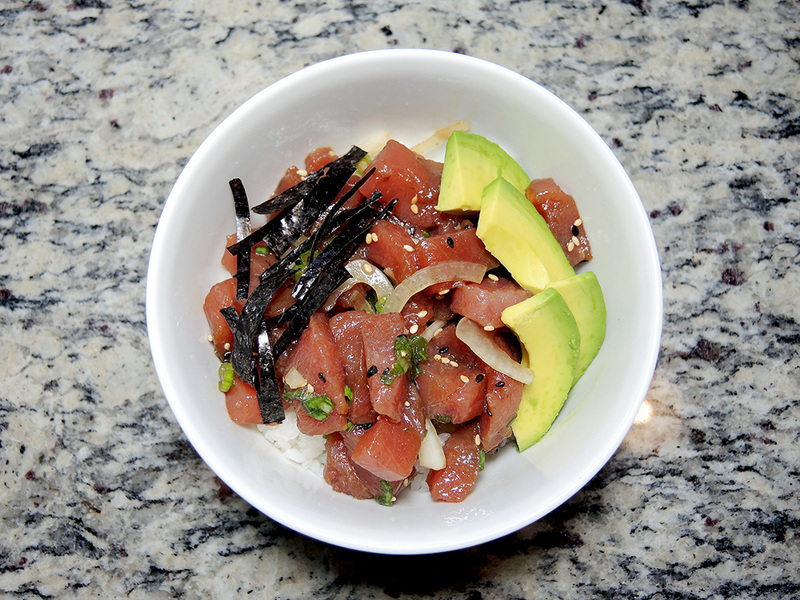 Tuna Poke with Scallions and Avocado. Note: “Sushi grade” is not a well regulated term in the U.S., so what you really want is fish that is frozen to temperatures that can kill bacteria (and kept at that temp until ready to be served) OR some very fresh or recently thawed fish from a source you trust like a reputable fishmonger, restaurant, or store. If you want to have rice with your poke, then be sure to cook some sushi rice (seasoned only with salt) prior to making the poke. Let the rice cool to room temperature before starting the recipe. Using hot rice won’t work as well because it could cook some of the fish and the contrast between the cool fish and hot rice isn’t always appetizing. You’ll want about a cup of rice per person. Before dealing with the tuna, thinly slice a quarter of a sweet onion into paper thin strips. Place those slices into a bowl and cover with cold water. Dump the water and cover the onion again with water. Let them sit like this for at least 20 minutes at room temperature. This should make the onions milder. 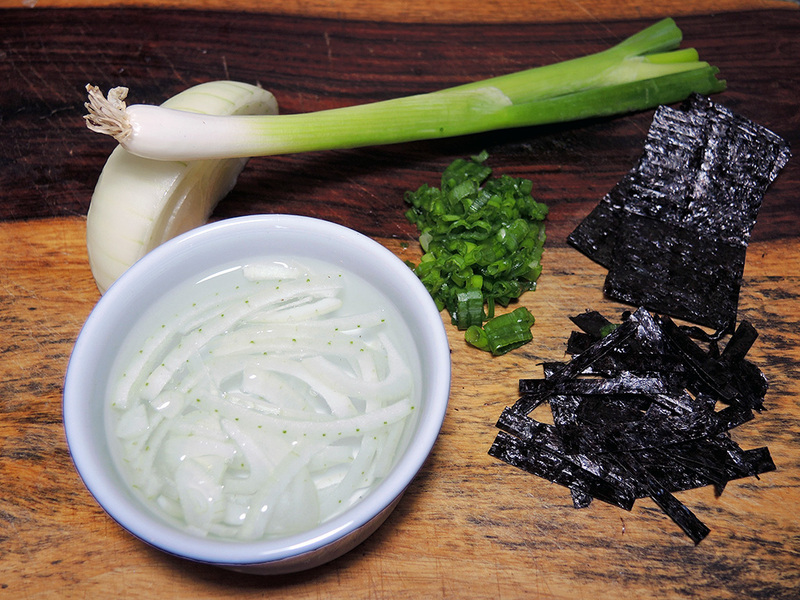 Dice up the scallions and optional seaweed nori strips. If your tuna is frozen, make sure to thaw it in the refrigerator (not at room temperature on the counter!). Follow directions on the package if any. 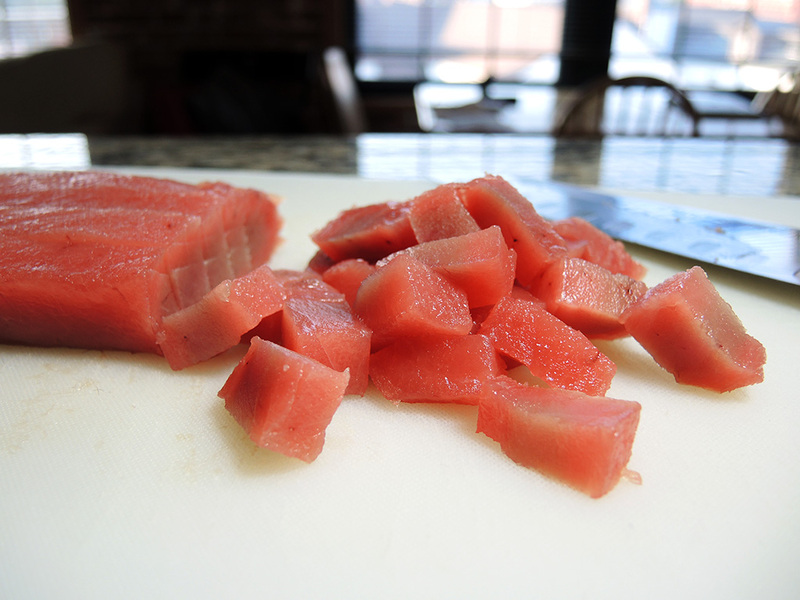 Once the fish is thawed, use a very sharp knife to cut it into small 1-inch or 1/2-inch cubes. Before continuing, however, make sure to smell the tuna. The fish should smell clean, extremely mild, and in some case have almost no distinct odor other than a vague ocean-like smell. If it smells strongly or has an unappetizing fishy smell then don’t use it. 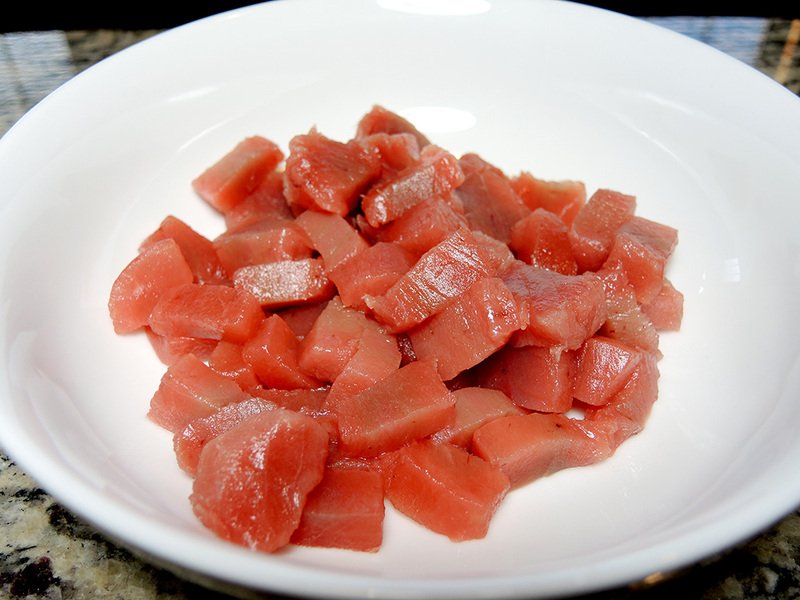 Once cut up into small cubes, place all of the fish into a large bowl for mixing. With the tuna in the bowl, add in the tablespoon of soy sauce, 1/2 teaspoon of Asian-style sesame oil, tablespoon of thin sliced sweet onion, tablespoon of diced scallions, 1/2 teaspoon of toasted sesame seeds, and 1/4 teaspoon of black sesame seeds (13 calories). Using a large spoon mix up all of the ingredients while being careful not to bruise or break up the fish. That’s it! Now you have poke! You could stop here and just eat the poke immediately, but why not make a meal out of it and add some more ingredients? Slice an avocado and add it directly to the poke or use it as a topping to enrich the dish even more. The rich green avocado complements the texture of the tuna wonderfully. Serve the poke over room temperature rice to make it into a heartier filling meal. Add a few strips or nori seaweed on top of a serving to break up the flavor and add the periodic sense of eating sushi. Lastly, if you’re really adventurous and love spicy tuna rolls, try splitting the poke in half and placing one half in another bowl. Then mix up some Kewpie mayonnaise (a certain brand of Japanese mayo that is smoother and richer than American mayo. It is also made with rice vinegar and MSG) with a few drops of sriracha hot sauce. Add a teaspoon of the spicy mayo to the tuna until you get the desired mix. For half the tuna, I think 1 to 2 teaspoons is plenty. 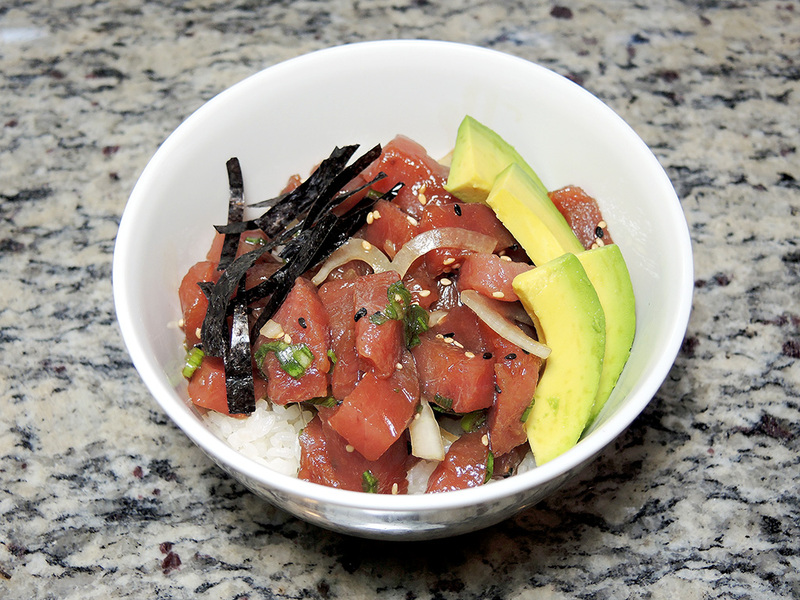 Then serve the regular poke and spicy poke even in the same bowl for a totally varied flavor combination. 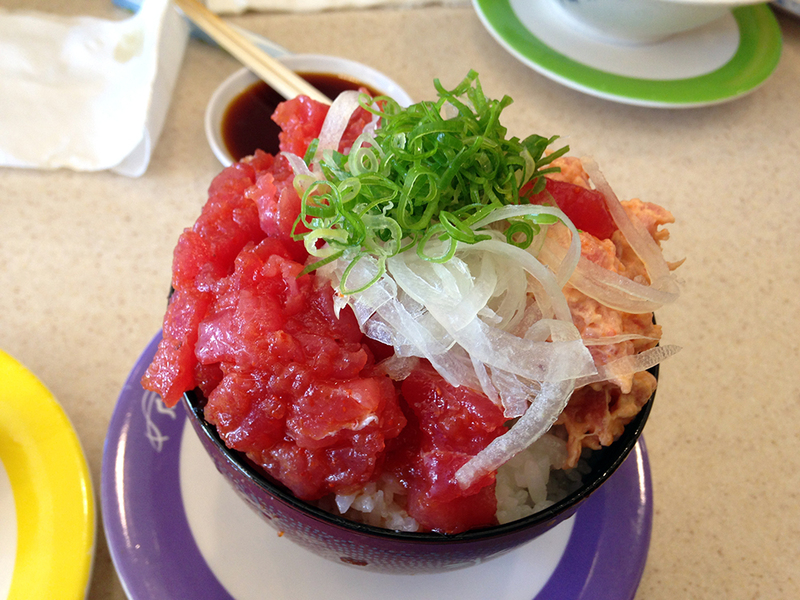 This is the best approximation to an amazing dish I had while in Oahu, Hawaii at a restaurant called Sushi Bay. The dish there is called the Mix Don bowl. Simply amazing! You found fresh tuna! Where’d you end up going? Also, this looks amazing! Thanks! Wholefoods has frozen yellowtail and Wegman’s has nice thawed red ahi tuna. There’s also Tony’s Seafood in Seekonk, MA that has frozen tuna and salmon. Nice! You sound like you did a bit of running around there but looks like it was totally worth it!